Sir Thomas Bludworth (also spelt Bloodworth) is usually only remembered as the man who had the unfortunate job of being Lord Mayor of London when the Great Fire broke out in 1666. So, given the fire’s 350th anniversary this month, we thought it timely to take a more in-depth look at his life and career. Bludworth was born in London in February, in about 1620, the second surviving son of John Bludworth, master of the Vintner’s Company and a wealthy merchant. Trained to succeed his father – his elder brother having joined the clergy, Bludworth was himself admitted to the Vintner’s Company in the 1640s and joined the Levant Company in 1648. First elected an alderman in 1658, he was discharged when he refused to serve as a sheriff and the following year served as the master of the Vintner’s Company. In 1660, he was briefly arrested along with 10 other members of City of London’s common council after the body refused to pay taxes until a representative parliament was convened. Elected MP for Southwark later that year, Bludworth among city and parliamentary representatives who sailed to The Netherlands to attend the king, Charles II, in exile, and invite him to return to England. It was while attending the king in The Hague that he was knighted. Re-elected in 1661, he was an active parliamentarian who served in numerous different capacities. Sir Thomas was twice married and had a number of children including a formidable daughter Anne who eventually married the historically unpopular George Jeffreys, (later King James II’s Lord Chief Justice and Lord Chancellor). In mid-1662, he was once again made a City of London alderman and appointed one of two sheriffs for the following year. He became Lord Mayor of London in November, 1665, but apparently there was no pageant as was customary due to the plague. During his year in the office – “the severest year any man had” – he faced both the plague and the Great Fire and his reputation has been largely formed out of his response to the latter thanks in large part his alleged response when woken and told of the fire as being: “Pish, a woman might piss it out!”. Bludworth was heavily criticised at the time and over the years since his reaction to the fire – including not pulling down homes to create a firebreak and thus prevent the spread of the fire, but it should be noted that had he done so before he had received the king’s permission, he would have found himself personally liable. Diarist Samuel Pepys’ who, following two encounters in the months before the fire had already described Bludworth as “mean man of understanding and despatch of any public business”, recorded that when he finally brought a message from the king ordering the creation of a firebreak, Sir Thomas seemed like “a man spent”. Another eyewitness describes him as looking like he was “frighted out of his wits” during the fire. Sir Thomas’ own property at Gracechurch Street was among the casualties of the fire but he later built a new mansion in Maiden Lane. He continued to serve as an MP after the fire and was, perhaps ironically, appointed to a committee working on a bill to provide “utensils” for the “speedy quenching of fire”. In the mid-1670s, he become one of the governing members of the Royal African Company. 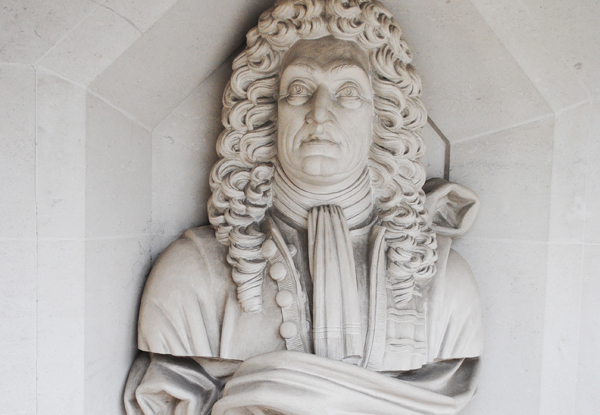 Sir Thomas died on 12th May, 1682, aged around 60. He was apparently buried in Leatherhead. Located on the south side of the Strand, the then-named Exeter House was built in the 1300s as the London palace of the Bishops of Exeter on land which had previously been occupied by the Knights Templar. 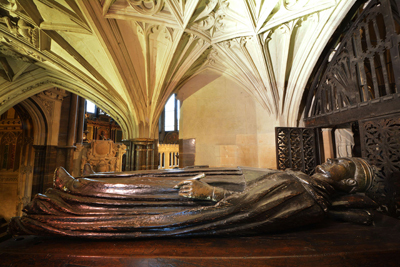 It was Bishop Walter Stapledon who had the palace constructed – as well as being Bishop of Exeter, he was Lord High Treasurer to the unpopular King Edward II, a role which eventually led to him being dragged from his horse in the City of London and murdered. King Henry VIII gave the property to his Secretary of State, William, Lord Paget, and, in the late 16th century, it came into the hands of Robert Dudley, the 1st Earl of Leicester. He rebuilt it and renamed it Leicester House which it remained until, following his death in 1588, it was inherited by his stepson, Robert Devereux, the 2nd Earl of Essex and a favourite of Queen Elizabeth I, and renamed Essex House. The house was rather large and in 1590 was reported as having as many as 42 bedrooms as well as a picture gallery, a banqueting suite and chapel. Devereux ended up beheaded for treason on Tower Hill in 1601 but his son, also Robert Devereux, became a distinguished general for the Parliamentarians during the Civil War. He received a delegation from the House of Commons at the property to offer their congratulations after the Battle of Newbury in 1643 and was laid out in state there in 1646 (insatiable diarist Samuel Pepys, then a 13-year-old boy, was among those who saw the body). After the Civil War, the family’s debts resulted into the property passing into the hands of other families. The main part of the house was eventually demolished in the 1670s and part of the property sold to developer Nicholas Barbon. He built Essex Street, which still stands in the area, was built on the site. The remaining part of the house, meanwhile, was used to house the Cotton Library before, in 1777, it too was demolished. The mansion’s chapel, meanwhile, became a dissenters meeting house, known as the Essex Street Chapel, which became the birthplace of Unitarianism in England. The denomination’s headquarters, named Essex Hall, still stands on the site. 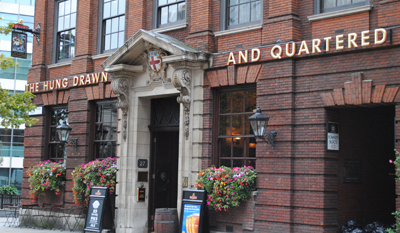 The pub The Devereux (pictured above), named for Robert Devereux, is among the buildings which now stand on the site (for more on the pub, see our earlier post here). The National Maritime Museum is hosting a new exhibition on the life of Samuel Pepys and, while we’ve looked at the life of the famous diarist before (see our earlier post here), we thought we’d take a look at his not-so-famous manservant and clerk William Hewer. “Will” Hewer, who is mentioned several times in Pepys’ diary and, as well as being a business partner also became a fast friend of Pepys, is thought to have been born in about 1642. He was first introduced to Pepys when still a young man – about 17 – by his uncle Robert Blackborne in 1660. They obviously hit it off because Hewer, who was the son of a stationer, was soon working as a manservant and clerk for Pepys in his role as Clerk of the Acts to the Navy Board. Hewer, who was subjected to some bullying by Pepys who apparently could reduce him to tears (but at the same time Pepys also defended him at work from attacks from others), at first lived with Pepys at his Seething Lane home. However, by late 1663 – apparently thanks to his misbehaviour which included staying out late, drunkenness and corrupting maids – he was told to leave Pepys’ house and moved into his own lodgings. Pepys moved to the Admiralty in 1673 and Hewer went with him, appointed Chief Clerk the following year. In 1677, he was appointed as Judge Advocate-General. Hewer’s star continued to climb and in 1685, he was appointed MP for Yarmouth, on the Isle of Wight. The following year he was appointed to the Special Commission which replaced the Navy Board and had a special responsibility for accounts. After King James II fled the country in 1688, Hewer, along with Pepys, lost their patronage from the Crown; both were briefly imprisoned, but were released without trial. Thanks largely to his involvement in trading with his uncle Blackborne – who served as both Secretary to the Admiralty and Secretary to the British East India Company and to an inheritance he received from his father, Hewer became a wealthy man (as was the case with Pepys, there have been suggestions he may have made considerable illicit sums from people doing trade with the Navy thanks to his position, but these claims have not been substantiated). Hewer, who never married (but he did apparently have a special attachment to Pepys wife Elizabeth who was of a similar age), owned a house near The Strand which became the Admiralty Office when he followed Pepys from the Navy Board. Pepys lived with him in the house when he was at the Admiralty. He also owned other properties, including a country retreat on Clapham Common which he bought in 1688. It was here that Pepys lived in during his latter years (and where he died in 1703). Hewer was the executor of Pepys’ will and kept his library – including, of course, his famous diary until his own death on 3rd December, 1715. 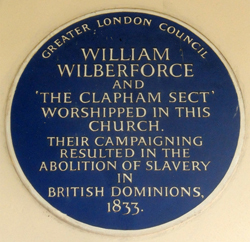 He was buried in St Paul’s Church, Clapham. In an odd twist, his estate was left to his godson Hewer Edgeley but only on the condition that he change his surname to Hewer, becoming Hewer Edgeley-Hewer. Hewer is depicted in a painting by Godfrey Kneller (1689) now in the National Maritime Museum’s collection. It was a pair with another painting by Kneller of Pepys. WHERE: Samuel Pepys: Plague, Fire, Revolution is at the National Maritime Museum, Greenwich (nearest DLR station is Cutty Sark; nearest railway stations are Greenwich and Maze Hill; and nearest river pier is Greenwich); WHEN: 10am to 5pm daily; COST: £12 adults/£6 children WEBSITE: www.rmg.co.uk/see-do/exhibitions-events/samuel-pepys-plague-fire-revolution-exhibition. For more on Pepys, see Margarette Lincoln’s book Samuel Pepys: Plague, Fire, Revolution . 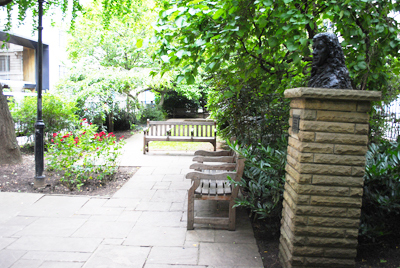 This small, simply laid out garden in the City of London is redolent with history. It was once the site of the Navy Office, the workplace of diarist Samuel Pepys, and it was in the garden of this building that he and Sir William Penn buried their wine and parmesan cheese for safety during the Great Fire of London in 1666. The office survived the Great Fire but was, oddly enough, destroyed by fire only a few years later in 1673 (there is a blue plaque commemorating it in the garden) and a new office, designed by Sir Christopher Wren, was built here in the early 1680s before it was demolished in 1788. 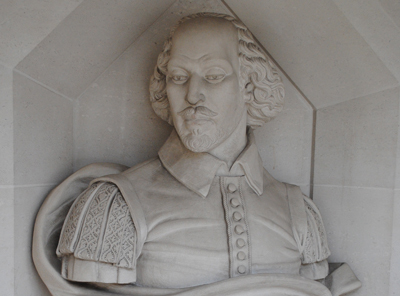 It’s due to its association with Pepys (who also lived in the street and was buried in the nearby church of St Olave Hart Street) that it boasts a bronze bust of him which was erected by the Samuel Pepys Club in 1983, designed by Karin Jonzen and funded by public subscription. It was presented to the garden by Fred Cleary who played an instrumental role in encouraging green spaces in the Square Mile in the 1970s. The garden, which was laid out in about 1950, is also notable for its beds of red roses, planted to commemorate the deal struck in 1381 in which the Sir Robert Knollys was belatedly granted permission for a footbridge his wife had built over Seething Lane. She had done so contrary to planning rules while he was away fighting with John of Gaunt (ostensibly so she could avoid the dust of the street when crossing from her house to her rose garden), and so when he returned, the City of London Corporation allowed the bridge (now long gone) to remain, but only in exchange for the symbolic “penalty” of one red rose a year. 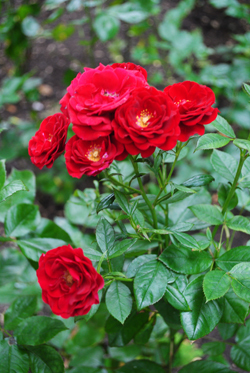 The occasion is still marked each June in a ceremony overseen by the Company of Watermen and Lightermen of the River Thames in which a red rose is plucked from the garden and delivered to the Lord Mayor of London at Mansion House. WHERE: Seething Lane Garden, Seething Lane, City of London (nearest Tube stations is Tower Hill); WHEN: Daily; COST: Free; WEBSITE: www.cityoflondon.gov.uk/things-to-do/green-spaces/city-gardens/Pages/default.aspx. It’s 350 years ago this year that the Great Plague broke out in London in 1665, bringing death on an unprecedented scale to the city. The plague, which was apparently also known as the Poor’s Plague, is said to have broken out in early 1665 – perhaps February – with the first areas to be affected dockside districts and the crowded slum of St Giles in the Fields before it moved into the City proper. There are claims that the outbreak’s origins occurred a couple of months earlier at a property in Drury Lane where contaminated bales of goods imported from Holland were opened by Flemish weavers. However it came to be in London, it soon spread and by July was running rampant with many of the nobility, merchants, and tradesmen choosing to flee the city in the hope of escaping its reach. They included King Charles II and his family and court who moved to Hampton Court in early July and then to Salisbury at the start of August before, following some cases there, to Oxford in September. Those who did come down with the disease – generally thought to have been bubonic plague, a disease of rats which is transmitted to humans via fleas – were confined to their homes with red crosses and the words ‘Lord, have mercy on us’ painted on the door while gatherings in public – such as for the theatre – were banned to prevent the disease’s spread. Other measures to contain the disease included the imposition of a curfew and the killing of an estimated 40,000 dogs and 200,000 cats, thought to be spreaders of the disease, on the orders of the mayor, Sir John Lawrence. Bills of mortality recorded the number of deaths weekly – in the week of 19th to 26th September, the number peaked at 7,165 people before declining. By late in the year life in the capital had started returning to normal. While the bodies were buried in mass graves, by September the growing numbers of dead meant many were simply left to rot where they fell. The estimated numbers of those who died varies somewhat depending on the source but according to the Museum of London’s website, the Great Plague of 1665 is estimated to have killed 100,000 people – about a fifth of the population – within just seven months of its outbreak. 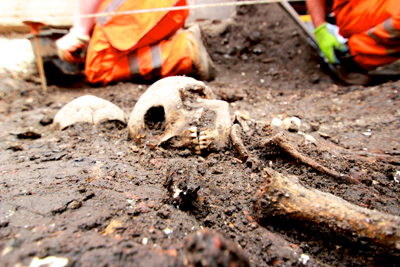 While the sheer number of dead is unprecedented, other plagues were proportionally deadlier, in particular the coming of the Black Death in 1348 which killed about half of all Londoners over an 18 month period (equating to an estimated 40,000 people). The Great Plague was, thankfully, the last major plague to affect London. 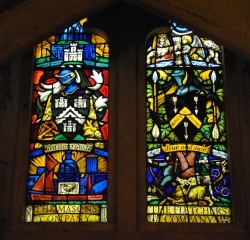 Among those who had survived was the diarist Samuel Pepys whose entries provide a valuable source of information on how the plague affected Londoners (pictured above is detail from the gateway into the church of St Olave Hart Street – Pepys’ parish church at the time of the plague – where a number of victims of the Great Plague were buried). 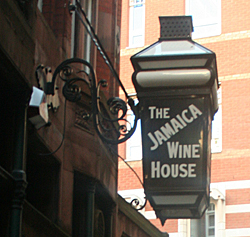 Located on the site of London’s first coffee house in St Michael’s Alley in the City, the Jamaica Wine House comes with plenty of yesteryear atmosphere. The coffee house, which was established in 1652 at the sign of ‘Pasqua Rosee’s Head’ (named for one of the co-owners, a Turk and former manservant called Pasqua Rosee), was once frequented by the likes of diarist Samuel Pepys who apparently had a pleasurable night there on 10th December, 1660. Standing in the midst of what became a hotspot for coffee houses in London, it was apparently damaged in the Great Fire of London of 1666. Rebuilt as the Jamaica Coffee House in the 1670s, it become known as something of a gathering place for seafarers who were involved in the West Indies trade. The current name bears testament to that past (we’ll take a more in-depth look at the history of the coffee house in an upcoming Lost London post). While the building which housed the coffee shop is long gone, the current Grade II-listed building, located just of Cornhill, dates from 1869 and was built as a public house. Built of red brick and red stone, retains much of its Victorian character outside and in – with the latter featuring dark wood panelling on the walls and decorative ceilings and glasswork. The basement features a wine bar. These days the establishment – which is known fondly to regulars as the ‘Jampot’ – boasts a clientele which includes City workers as well as “bell-ringers” and walking tourists (or so the website says). And then there’s the three ghosts – one of which is said to be a dog. Now part of the Shepherd Neame chain (which purchased it in 2009). For more, see www.shepherdneame.co.uk/pubs/london/jamaica-wine-house. 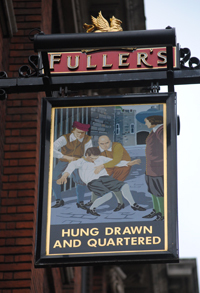 The rather grisly name of this pub (and there’s some debate over whether hanged or hung is grammatically correct) relates to its location close by the former public execution ground of Tower Hill. 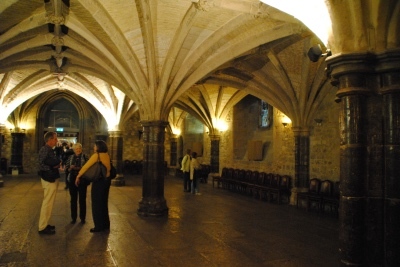 While for many Tower Green inside the Tower of London is synonymous with beheadings, only seven people, including Anne Boleyn, were ever actually executed there. Far more people were executed outside the Tower’s walls at nearby Tower Hill, just to the north. 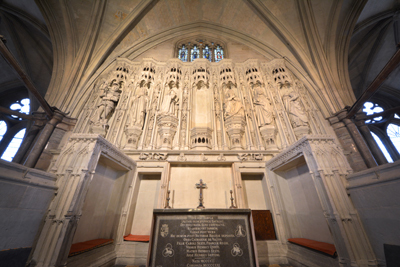 Some of the names of those executed here are recorded on a memorial at the site – everyone from Simon Sudbury, the Archbishop of Canterbury who was beheaded here by an angry mob in 1381, through to Sir Thomas More in 1535 (gracious King Henry VIII commuted his sentence from being hung, drawn and quartered to mere beheading), and Simon Fraser, the 11th Lord Lovat, a Jacobite arrested after the Battle of Culloden and the last man to be executed here when his head was lopped off in 1747. While, as you can see above, many of those executed at Tower Hill were beheaded (and most were of the nobility), there were some executions there which did involve the guilty party being hung, drawn and quartered – a punishment reserved for those being convicted of high treason and also enforced at other sites in London including at Tyburn and Smithfield. Among them was William Collingbourne in 1484 for supporting the cause of Henry Tudor against that of King Richard III. A plaque on the external wall of the nearby pub quotes a passage from the famous diarist Samuel Pepys after he witnessed an execution in Charing Cross on 13th October, 1660: “I went to see Major General Harrison. Hung drawn and quartered. He was looking as cheerful as any man could in that condition”. 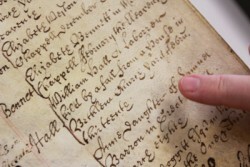 Thomas Harrison fought with Parliament during the Civil War and was among those who signed the death warrant of King Charles I. Found guilty of regicide after the Restoration, he was hung, drawn and quartered (though as Pepys tells us, not here). 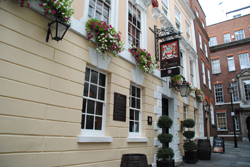 The pub, located at 26-27 Great Tower Street, is part of the Fuller’s chain. For more, see www.hung-drawn-and-quartered.co.uk. While the first official records of this Bankside pub only date from 1822, the pub’s history goes back much further. 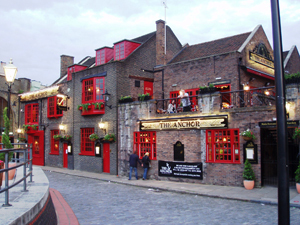 Like many pubs in London, nailing down its exact origins is tough but the story goes that it was named The Anchor by seventeenth century merchant Josiah Child. Child owned the brewhouse which had been established in 1616 by James Monger at a site known as Dead Man’s Place (close to where the original Globe Theatre had stood before burning down in 1613) and was also a merchant who supplied the navy with everything from masts and spars to stores and beer. Hence the name The Anchor. It’s speculated that William Shakespeare himself might have had a drink here and it’s believed to be from this pub – “a little alehouse on Bankside” – that diarist Samuel Pepys witnessed the destructive power of the Great Fire of London in 1666. Dr Samuel Johnson – apparently a close friend of later brewery owners, Henry and Hester Thrale – was among regular drinkers. Other patrons, according to the pub’s website, included the artist Joshua Reynolds, Irish poet Oliver Goldsmith, actor David Garrick and Irish statesmen Edmund Burke. The pub was apparently rebuilt a couple of times after being destroyed by fire. The brewery, meanwhile, rose to become one of the largest in the world before it was finally demolished in 1981 leaving the pub, the brewery tap, still standing. Refurbished in recent years, the pub today contains a room dedicated to The Clink prison, the Bishop of Winchester’s lock-up which was located in nearby Clink Street. The waterside pub at 34 Park Street is now part of the Taylor Walker chain. You can find out more about it here. 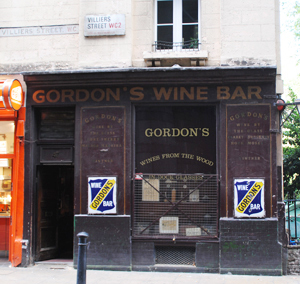 The honour of being London’s oldest winebar goes to Gordon’s Wine Bar at 47 Villiers Street in the West End (just up from Embankment Tube Station or down from Charing Cross Station, whichever you prefer). The venerable establishment – still a favoured place to stop for a drink for many Londoners – opened its doors in the 1890s and still conveys a powerful sense of old world charm with the decor pretty much unchanged (there’s been no fancy makeover here) and the wine still served from wooden casks behind the bar. 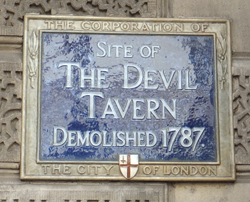 The site on which the bar is located was once occupied by York House (home to, among others during its centuries of life, Robert Devereaux – 2nd Earl of Essex and favourite of Queen Elizabeth I and Sir Francis Bacon – Lord Chancellor during the reign of King James I) and then, later on, by a large house lived in by diarist Samuel Pepys in the late 1600s before, thanks to its position close to the river, a building was built upon it in the 1790s which served as a warehouse. The usefulness of the warehouse came to an end when Victoria Embankment was built and the river pushed back and the building was subsequently used for accommodation. Writer Rudyard Kipling was among tenants who lived here (from 1889-1891 during which wrote The Light that Failed – in fact, the building was renamed after him, Kipling House, in 1950. 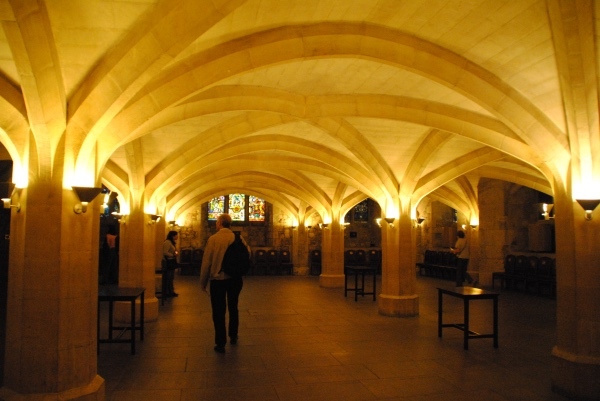 It was Angus Gordon, a “free vintner” meaning he didn’t have to apply for a licence thanks to the largesse of King Edward III in 1364, who established the premises in the vaults here in the 1890s (interestingly the current owners are also Gordons, but not related). Among the other uses of the building, of which Gordon’s only occupies a part, was apparently as a brothel in the 1920s. For more on Gordon’s head to www.gordonswinebar.com. 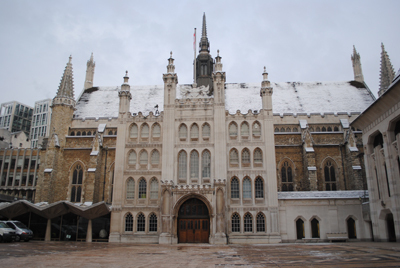 Once part of the Palace of Whitehall, the Cockpit (also referred to as Cockpit-in-Court or the Royal Cockpit) was initially built as a pit in which to watch cockfighting as part of renovations carried out by King Henry VIII after he “acquired” Cardinal Wolsey’s former property of York Place and before transforming it into a royal palace. It was one of a number of entertainment related buildings constructed by the king in the new palace precinct – others included a real tennis court, bowling alley and a tiltyard. By Jacobean times, the use of the octagonal-shaped cockpit – located between today’s Downing Street and Horse Guards Parade – had changed into that of a private royal theatre and in 1629 Inigo Jones was given the task of redesigning it to accommodate King Charles I’s elaborate court masques (Jones had previously redesigned the Cockpit Theatre in Drury Lane). Following the Restoration in 1660, the Cockpit again returned to its use as a theatre and King Charles II had new dressing rooms added and the decor given an overhaul (the ever-present diarist Samuel Pepys was among those who attended theatrical presentations during this period and Ben Jonson among those whose work was presented here). The theatre building is believed to have been demolished around 1675 and the site subsequently used to house government officials including those of the Foreign Office (see our earlier post here) and Privy Council. In the 1730s, William Kent designed the building (which although since expanded and modified) now stands on the site and is currently the home of the Cabinet Office. While the Cockpit is long gone, its name lives on in ‘Cockpit Passage’ – a gallery inside the Cabinet Office from where one could once watch tennis being played. One of the major thoroughfares of the City of London, Cannon Street’s name has nothing at all to do with artillery or religion. In fact, the street, which runs from St Paul’s Churchyard in the west to Eastcheap in the east, owes its name to the industry that once took place there. Like many other streets in the City connected with the occupations of past residents, Cannon Street is a corruption of a street formerly known as Candelwichstrete (one of many various spellings of which the modern English version is Candlewick Street) which relates to the candlemakers and wax chandlers who lived and conducted their trade along the street in the Middle Ages (the Tallow Chandlers Company, involved in regulating candle-making, has been located in adjoining Dowgate Hill since 1476, although the current building dates from 1672). The name was gradually corrupted into Cannon Street (apparently the corruption was at least partly due to its pronunciation in the Cockney dialect), which is what it was known as by the late 17th century when the seemingly ever-present Samuel Pepys was writing his diary. Cannon Street – which was only extended to its current length in the mid-1800s under the supervision of architect JP Bunning, having formerly been a narrow lane which stopped at Dowgate Hill in the east – apparently later become known for the number of drapers based there and was also home to the Steelyard or Stalhof, the trading base of the German Hanseatic League in London in the 13th and 14th centuries (a plaque commemorating this was erected at Cannon Street Station in 2005). Now lined with office buildings including some former warehouses from the Victorian era, the street is also home to a recently redeveloped above ground train station and Underground station- both of which were opened in the late 1800s (the station, which built was on the site of the Roman governor’s palace, was originally located behind the Cannon Street Hotel, birthplace of the British Communist Party). Cannon Street is also the location of the mysterious London Stone – formerly located at the now long-gone St Swithin’s Church, it can be found behind a grill at number 111 – for more on it, see our earlier post here).